Home » Funny, Pop culture, Space » OMG! SPACE! Last night Stephen Colbert had astronaut Garret Reisman on the show, live from the International Space Station, after being seen wearing a WristStrong bracelet. 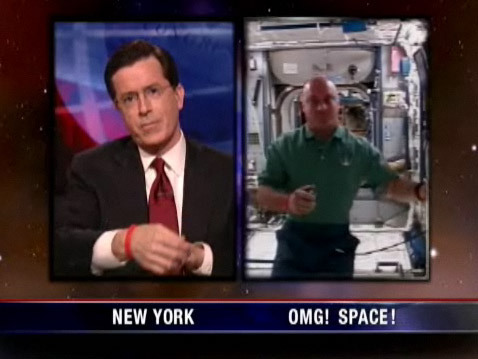 This entry was posted on Friday, May 9th, 2008 at 7:14 pm CET and is filed under Funny, Pop culture, Space	with tags Funny, iss, nasa, Space, stephen colbert. You can follow any responses to this entry through the RSS 2.0 feed. You can leave a response, or trackback from your own site.